While sustained removals of lionfish in shallow water can limit the impacts of these invasive species in certain locations, devices conceived for deep water control have not yet proven effective. 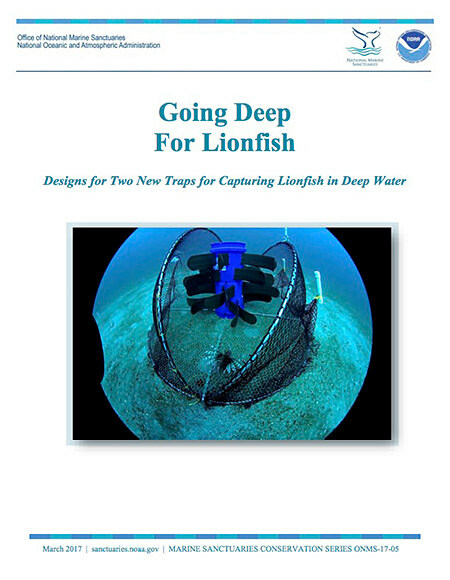 Two new trap designs are presented that can target lionfish in deep water and reduce negative effects on native species that are ecologically, recreationally, or commercially important. The traps may also support efforts to meet the increasing demand for lionfish in the seafood market. The proposed designs have structural components that provide vertical relief to attract lionfish, and low profile frames that remain open during deployment. They have several benefits over conventional fish traps, including high attraction rates for lionfish, limited or no by-catch, no mortality from containment during the soak period, no bait to attract non-targeted species, no potential for ghost fishing, and easy portability on a fishing vessel.